London, 9th June 2011: Her Highness Sheikha Mozah of Qatar and British Culture Minister, Ed Vaizey, were guests of honour at the launch of an eye-opening new exhibition at The Royal Society in London today. Arabick Roots is a new display highlighting surprising connections between the scientific pioneers of Muslim Civilisation and seventeenth century Britain’s greatest scholars and scientists. The exhibition displays rare books, scientific instruments and correspondence, showing how science and culture from the Muslim Civilisation influenced and inspired key figures such as Edmund Halley and Robert Boyle. 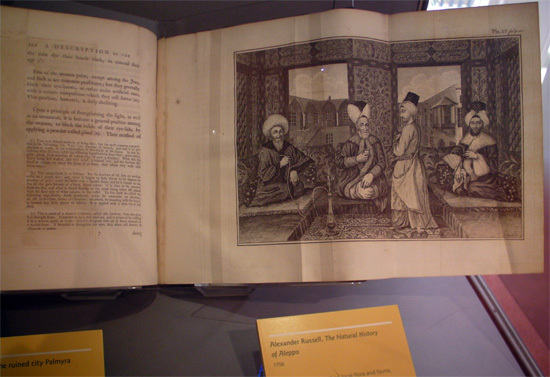 Early Fellows of the Royal Society eagerly pursued works in Arabic and Persian as well as communicating with their intellectual contemporaries in the Arabic-speaking world. At a time when international collaboration is increasingly important to the advancement of science, Arabick Roots reveals the rich and often surprising history of scientific communication between two very different cultures. 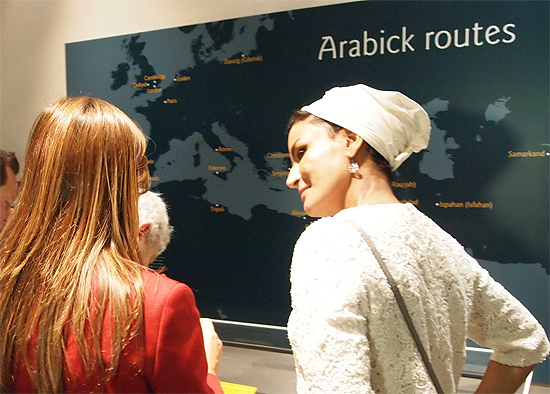 Dr. Rim Turkmani gives HH Sheikha Mozah a tour of the Arabick Roots exhibition. The Arabick Roots exhibition is sponsored by the Qatar Foundation. The research for Arabick Roots has been sponsored by the Foundation for Science, Technology and Civilisation (FSTC) and the exhibition curator is FSTC Fellow Dr. Rim Turkmani. FSTC also created the internationally renowned and award-winning 1001 Inventions exhibition that was recently opened by the US Secretary of State, Hillary Clinton, in California. Also present at the launch event was former British Foreign Office Minister for the Middle East, Baroness Symons, who said: “Congratulations to FSTC on this excellent exhibition. It is superb. Like many other people, I had no idea how extraordinarily innovative the Arab scientists were and how much contact there was between this country and the Arab nations on science." 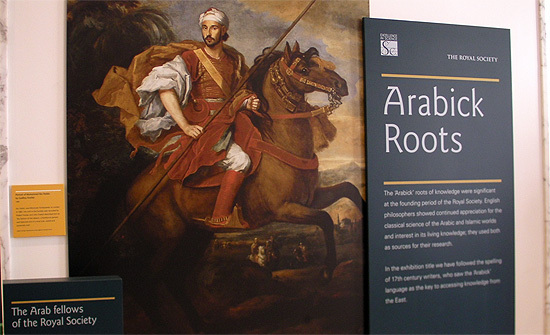 Arabick Roots will be open 9am - 5pm in the week of the Royal Society's Summer Science Exhibition (5 - 10 July, 2011); at all other times guided tours are by appointment (call +44 20 7451 2597). Entrance is free. The exhibition runs until November 2011, after which it will transfer to Doha. The exhibition catalogue can be downloaded as a PDF file by clicking here. The surprising history behind one of the most significant medical advances of all time will be revealed in Arabick Roots. Famously, vaccination against infectious diseases was pioneered by Edward Jenner in the last years of the eighteenth century. 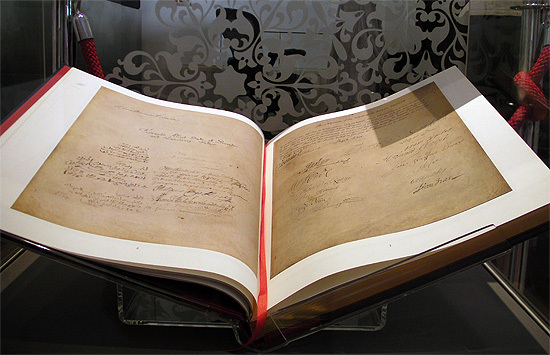 However, Arabick Roots shows how thinkers from the Arabic and Muslim world helped to pave the way for Jenner's great breakthrough and other key advances in astronomy, medicine and other disciplines. 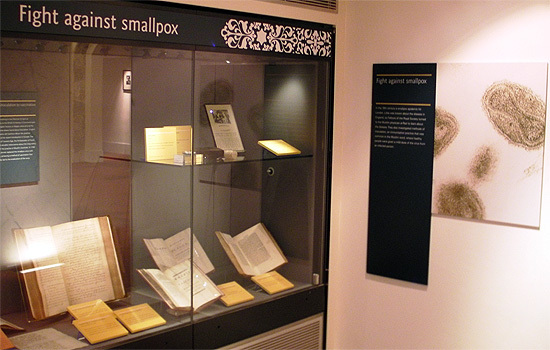 When London was devastated by a smallpox epidemic in the mid-eighteenth century, Fellows of the Royal Society turned to their counterparts in the Arabic world to help them understand this terrible disease. In letters seen publicly for the very first time in this exhibition, the Ambassador to Tripoli at the time, Cassem Algiada Aga, describes the practice of inoculation, which had been taking place for centuries in North Africa and the Middle East. Aga’s letters provided valuable first-hand reassurance about the safety of inoculation at a time when there was serious public fear and mistrust of this life saving practice in Europe, and he was made a Fellow of the Royal Society, joining two existing Arab Fellows, Mohammed Ibn Haddu and Ben Ali Abgali. 1. The Foundation for Science, Technology and Civilisation (FSTC) is the creator of the global brand 1001 Inventions. FSTC is a British not-for-profit, non-political, and non-religious academic organisation founded in 1999 by a group of philanthropic historians, scientists, engineers and social scientists. It is dedicated to researching and popularising the history of pre-Renaissance civilisations, especially the Muslim civilisation, that have had an impact upon the scientific, technological and cultural heritage of our modern world. See www.fstc.org.uk for more details. 2. Dr Rim Turkmani is a Dorothy Hodgkin Research Fellow of the Royal Society and a Fellow of the Foundation for Science, Technology and Civlisation (FSTC). She works at the Astrophysics group at the Imperial College London. She also specialises in the impact of the Arabic science on the scientific revolution, and has conducted original research in this area which was developed into the ‘Arabick Roots’ exhibition. Having studied and worked as a scientist in many countries, including her home Syria, she has particular appreciation of cultural diversity in science and the importance of dialogue in the making of modern science. 3. The Royal Society is the UK’s national academy of science. Founded in 1660, the Society has three roles, as a provider of independent scientific advice, as a learned Society, and as a funding agency. Its expertise is embodied in the Fellowship, which is made up of the finest scientists from the UK and beyond. The Royal Society’s annual Summer Science Exhibition showcases the most exciting cutting-edge science and technology research. It provides a unique opportunity for members of the public to interact with scientists and ask them questions about their work. This year’s Summer Science Exhibition 2011 will be held from 5 - 10 July at the Royal Society's main premises in central London and is free to attend. The Exhibition is the Society's main public event of the year and is open to members of the general public as well as students and teachers, scientists, policymakers and the media. Click here for more details. 4. The Qatar Foundation for Education, Science and Community Development (QF) aims to support Qatar on its journey from a carbon economy to a knowledge economy by unlocking human potential. It was established in 1995 by His Highness the Amir Sheikh Hamad bin Khalifa Al-Thani. His wife, Her Highness Sheikha Moza bint Nasser, is the organization’s chairperson and driving force. See www.qf.org.qa for more details.